In need of one more side to complete your Thanksgiving feast? Attending a last-minute potluck? Cooks on limited time and funds know they can turn to the sweet potato casserole, a Thanksgiving day favorite that never fails to please. If you’re whipping up a sweet potato casserole recipe and want to save a few bucks, check out this simple recipe and some tips for cutting the cost of ingredients. 1. Place a sheet of heavy-duty foil on center oven rack and preheat to 425 degrees. 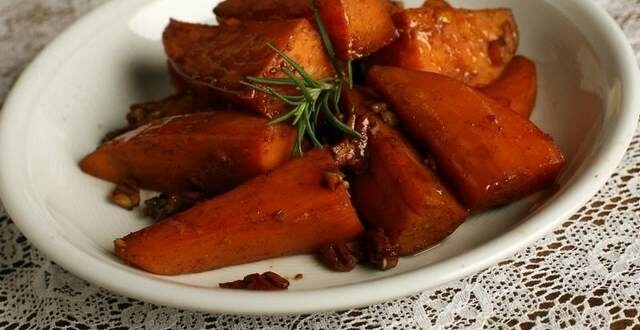 Pierce each sweet potato in several places and place in oven. Bake about 1 hour, or until very tender when tested in the centers. Remove from oven and cool slightly. 3. Spray a 2½-quart casserole dish with cooking spray. Pile the mashed sweet potatoes into the dish. Bake in a preheated 350-degree oven about 20 minutes. Top with marshmallows and continue baking 25 minutes, or until golden on top.